So far the anti-Israel bluster from Damascus, Tehran and Hizbullah strongholds in Lebanon appear to have disturbed none of the foreign statesmen or opinion-molders, whose alacrity to condemn Israel for any perceived transgression is nothing short of remarkable. Moreover, the veiled hints from Moscow about dire repercussions for the entire region in the event of an American attack, might also imply warnings about impending punishment for Israel. All the while, Israeli commentators strive to outdo each other with educated guesses about whether or not we are vulnerable, whether it would serve Bashar Assad’s interests to fire at us, whether we should retaliate and how. Much of the babble is superfluous. Regardless of what eventually transpires, all Israelis should be deeply troubled by the profound indifference abroad to our lot – blameless as we are in the internecine Syrian strife. The very fact, that a neighboring state could be presumed to be held to ransom for occurrences entirely out of its control, should shock world opinion. But it does not. 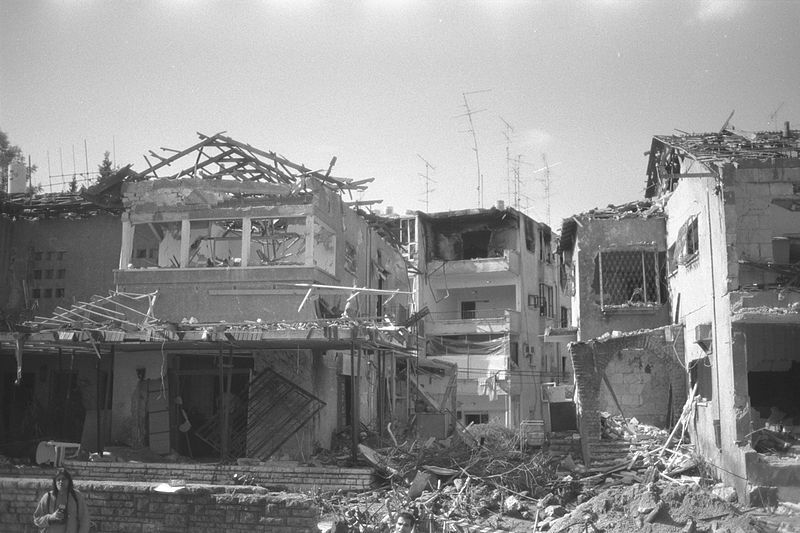 Israelis might be forgiven for suspecting that the reaction would be radically different had any other country been similarly threatened for no fault of its own. Sadly we must come to terms with the likelihood that different criteria are applied to the Jewish state. This is disconcertingly reminiscent of our extremely traumatic experience during the First Gulf War. Events then were also played out beyond the Israeli context. Nonetheless, Israel suffered repeated heavy missile attacks, including 40 Scud hits. The deadly warheads were aimed directly and unmistakably at civilian population centers. Saddam Hussein’s raison d’être was that by targeting Israel he was hurting the US. In the view of all too many Mideastern despots and potentates Israel is nothing but an American underling. At the time there was no audible international indignation. The only American response was to advocate Israeli restraint. Indeed Israel avoided retaliation, thereby compromising its deterrence and underscoring its vulnerabilities for the sake of American interests. But there was no gratitude for Israel’s sacrifices. Washington only pressured Israel for territorial concessions, never counted Saddam’s anti-Israeli aggression among his sins and treated Israel largely like a mistress whose favors are required but must never be publicly acknowledged. This might well be the role which the Obama administration now wants Israel to reprise. This is precisely the behavior which Israel must under no circumstances repeat. This time indeed Israel has made it clear – through pronouncements by Prime Minister Binyamin Netanyahu, Defense Minister Moshe Ya’alon and IDF Chief of General Staff Lt.Gen. Benny Gantz – that this country and its inhabitants will not be pawns in the wars that others wage. Thus notice had duly been served on friend and foe alike and all shades in between that Israel won’t consent again to humbly become a whipping boy for others. If anything can daunt the Shiite axis that buttresses Assad, along with his more distant supporters in Russia and China, it is such an unequivocal advance cautionary message from Israel. Some Assad-watchers in Israel maintain that he understands quite well that Israel of 2013 isn’t Israel of 1990. They note that it would make no sense for him to strike out against Israel because he knows that vigorous Israeli retribution would seal his fate. The experts are right – rationally that is just so. However, we had likewise heard precisely such learned estimations immediately prior to the first American invasion of Iraq and they too sounded eminently reasonable… to us. The problem is that this region does not operate according to our logic. Our only chance of survival is to “do what is right for us” and not what others tell us they “think” is best for us, but in fact is best for them. The loyalty of so called “friends” is nothing more than political expediency for their own altruistic and selfish reasons. To trust Hague and Carey would be a folly in the long term. Not only them, but all the players internally and from the sidelines, (except for Israel) are playing a dangerous game based on self interest and they will survive to more or less a degree. However Israel is the only country in this “balagan” whose very existence is at stake – and nobody other than Israel really cares whether we survive or not. Well, the targets for NATO planes from the careers in the Mediterranean can be easily changed from Damascus to Tel-Aviv. I think the main question we need to be addressing here is why the Fuhrer Hussein Obama gave orders to his “al-Qaeda-Muslim Brotherhood” minions to let off chemical weapons on innocent civilians and then concoct some cockamamie storyline about “Assad doing it”. Wonderfully eloquent as always, but why is your article appearing as today’s JPOST editorial without attribution to your authorship??? Certainly all will agree, Syria 2013 is not Iraq 1990. In 1990, the US military had overwhelming force in Iraq and did not need or want Israeli retaliation. Including Syria in the coalition was a nuisance, but at least that could be planned for. While Israeli warplanes and missiles (not included in plans) would have caused more difficulty. In the “fog of war”, Israeli airpower might have been confused with Saddam’s, and coordinating the last-minute addition to the coalition would have been time-consuming and caused delays. The Syrians might have gone off script; they were included for political reasons that were misguided but could not be erased at the last minute. Bush Sr. mostly likely anticipated Saddam’s strikes at Israel, Still, he choose to include Syria in the coalition, not Israel. He fancied himself another Lawrence of Arabia, who would have Arabs do his bidding–if only he would let them have their way (in another aspect). No doubt, demography and oil factored in the calculations. I don’t recall reading any reports of Iran’s mullahs threatening to attack Israel if the US attacks Syria. Perhaps Iran’s mullahs fear an Israeli counterattack would also disable their nuke program. Since Iran controls Syria, an attack by Syria should be considered an attack by Iran. You are so right Sarah ! But the good thing will be the degradation of Irans most important ally through the use of Americas military power…Obama will never act against Irans nuke program, but at least the butcher of Syria will probably force his hand to do ANYTHING ! And just remember Iraq…it will not be in a position, to attack Israel for quite some years to come. The entire western world, not just Israelis, should be more than troubled, we should be angry. In one month it will be the 65th birthday of the betrayal of Czechoslovakia as the European powers sought to appease hitler by ceding the Sudetenland. We all know how well that worked out. Would Israel be “a pawn in the wars that others wage” by striking Iran’s nuclear installations? This is the $64,000 question. Next question: If Obama touches off a war between Syria and Israel, will Israel be able and willing to strike Iran? This is Israel’s Hobson’s Choice. Israel may as well strike Iran first. You say that in the Middle East Israel is nothing but American property and this is the source of their hostility. But that’s not true. The source of their hostility is that Israel is a Jewish state. And of course Washington’s indifference is the same reason, Israel is a Jewish state. You say Israel is not going to passive while it is attacked by Syria or any of its relatives like it was during the Iraq War. I’m glad to hear it, but I’ll believe it when I see it. Is it possible that the U.S. is counting on Syria to attack Israel so Israel can then obliterate Assad? According to a recent article in WND by Reza Kahlili, Iran threatened to fire missiles at Israel if the US attacks Syria. This threat was published in Kayhannews. Of course, this would force Bibi’s hand. In this eventuality, he would have no choice but to counterattack Iran, and in the process, disable their nuclear program. Iran’s mullahs are irrational and suicidal, let us hope Bibi is rational. In the 1st Gulf War Israel did not retaliate for the SCUD bombardment for one reason: the Americans indicated that they would shoot down Israeli aircraft because they would not give the Israelis the IFF (Identification Friend or Foe) codes. George H. W. Bush was no friend of Israel, but he was nothing like Obama. Has Israel figured out what to do if the Americans try the same trick, and attack Israeli planes if they attempt to defend Israel? Or is this one of Obama’s convoluted schemes to destroy Israel while being able to claim that he had nothing to do with it. Thanks Sarah! Generally the threats against Israel aren’t even reported in the mainstream American media.